Are multiple ldap directories supported? Thanks! It seems to change with versions of CRX, and I was hoping that how it was done in 2.2 was how it is still done in 2.3, and it appears to be that way. One for CRX2.2 .. should work for CRX2.3 as well ..
AuthenticationSupport service missing. Cannot authenticate request. Yes. Please enable Logging for LDAP. If nothing is getting printed in log that mean there is something wrong with LDAP.conf file or repository.xml. 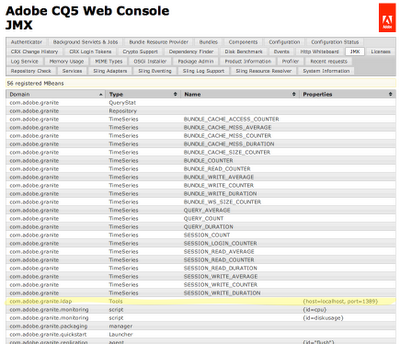 Is there any required to do this configuation other than a cq instance ? Sorry did not understand your question. Can you please elaborate ? I have followed above steps and used attached files . any idea where i am doing wrong ? That means your LDAP is not configured properly. Make sure that you get some message in ldap log when you enable debugging. You can also try manually starting CQ with param, Instead of using start script. If even that does not help, Create a daycare ticket and some one would be able to help. What is your take on the scalability of the users and groups implementation in CQ? Can this support Ldap synchronization of say upto million users? Is there any volumetrics shared by Adobe? There is no limit on number of users or group but there is limit on number of nodes you can have under one node (Avoid Flat hierarchy), before your system become slow. I guess in order to make changes in child node, parent node also needs to be bring in memory and hence more thrashing and slow performance. Looks like there is some invalid character in the login name. You can enable debugging on TokenAuthentication Handler module to find out more information. The issue is that the first login attempt which creates the account does not get a CRX Login Token. If you delete the login cookie for the nascent account and try logging in a second time it will work and get a CRX Login Token. Tokens are stored in the user's home directory jcr node tree. There is no home directory jcr node tree for an LDAP user that has never logged in. Autocreate mode specifies that the account is created on demand including the home directory. I think that the routine that creates the .tokens node is executed prior to the one that creates the parent node of .tokens (in this case /home/users/Adams\, Alice/A-Adams). The result is that it fails to create the .tokens node. The second LDAP login works, the home directory already exists and the .tokens node is created. If your LDAP account contains upper case letters an attempt to log in the first time without matching the case exactly triggers this bug. This was patched by Adobe but I'm not sure if the patch made it into a release. We have been running with a hotfix for some time now. I would recommend to create a node under user profile as soon as user login with login date. Reset every time user logs in again. For this you might have to create custom login module http://dev.day.com/docs/en/crx/current/deploying/custom-login-modules.html. Also note that as soon as user logs in a token is created for that user under /home/users//.tokens/ but this is not reliable. i have connected CQ55 with OpenDS directory server. CQ55 is able to communicate with the LDAP server but CQ is not fetching all the user or groups from LDAP server. Only after I login to CQ, the user and user related group is being fetched by CQ. Is there any explicit settings I need to provide. Please help. This is how LDAP login works. Only after login you would be able to get user related information. If you want to prefetch all data in advance please use user sync option as mentioned above. Please let me know if that make sense. Thanks for your reply. I have tried with the user sync option available through JMX. But, this option only pulls the information of the users who are available in CRX. It doesn't fetch all the users from LDAP. below I have given the jaas.conf file details. Can you please validate the same & let me know if the configuration is good enough. Ideally LDAP sync should sync all data, If not I would suggest to open a daycare ticket for that. Also you can create your own custom login module using http://www.wemblog.com/2012/06/how-to-add-custom-login-module-in-cq55.html to sync data from your LDAP. Hi, i'm trying to use the LDAP User Synchronization functionality in CQ5.5 (http://wem.help.adobe.com/enterprise/en_US/10-0/core/administering/ldap_authentication.html#LDAP User Synchronization) but i can not find the ldap entry inside 'Repository Configuration' to configure the list of DN to import. Am i missing something? Thanks! What Version of CQ are you using ? 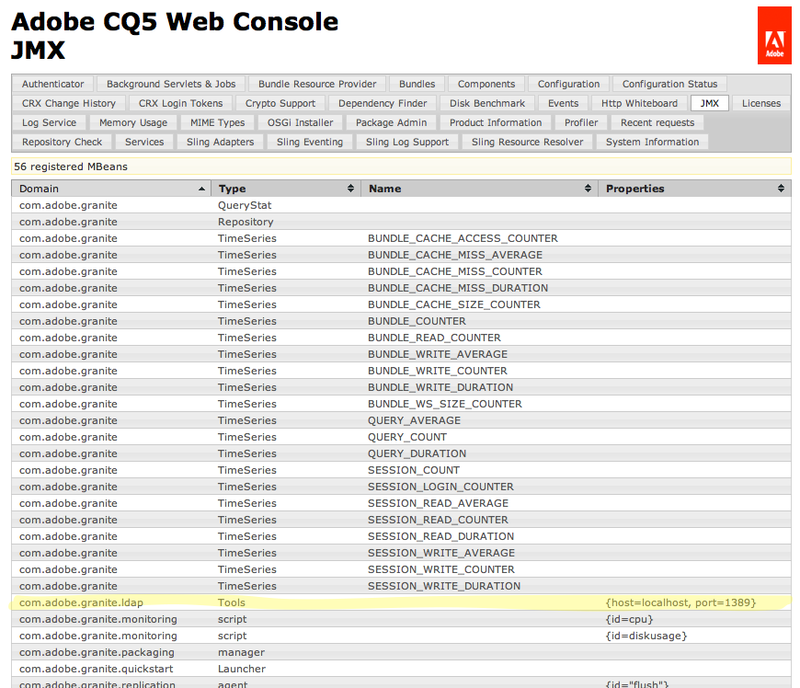 If you are using CQ 5.5 note that you need SP2.1 inorder to see that option. You can get SP2.1 from Daycare or public package share. I'm trying to implement the LDAP feature in CQ5.5. I've installed service pack 2 and restarted the system, but I'm unable to find granite.ldap in "JMX" felix console? is ldap exist in SP 2? or do i need to install SP 1 ? we are using AEM6 and Author able to login with LDAP Username and password without any issues but if author forget the password we are able to reset the password in AEM6 using Password rest option and unable to store the Latest password in LDAP server. Is there any Class or API available to do the authorization and authendication to update the latest password in LDAP via AEM server. Any idea why would it be? Appreciate your response.